Water resistance improvement of filter paper by a UV-grafting modification with a fluoromonomer_USA KINO Industry Co., Ltd. Corresponding author at: Dipartimento di Scienza Applicata e Tecnologia, Corso Duca degli Abruzzi, 24, 10129 Torino, Italy. Tel. : +39 011 5644619. 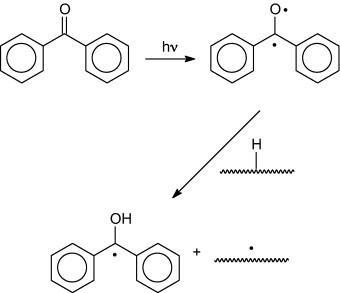 This work describes the surface modification of filter paper by a photoinduced grafting process involving a poly(oxetane) acrylic oligomer with short perfluoroalkyl chains. This modifier avoids the safety, environmental and health concerns of conventional long perfluoroalkyl-chain chemistries, without sacrificing their key performance features. Therefore the work provides an alternative to existing processes aiming to make the paper hydrophobic: the chemicals used are safe, the proposed functionalization process is rather simple and inexpensive, moreover can be adapted to paper making plants. 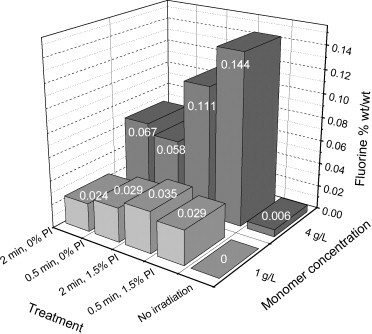 The experiments show that the grafting induced by UV irradiation changes the surface composition of the samples as assessed by surface spectroscopies and other measurements. As a result of the surface modification, water contact angles on treated paper surfaces were as high as 143° approaching superhydrophobicity. Also oleophobicity was improved (ϑ = 57°), guaranteeing grease and antistain resistance. Surface tension was strongly reduced and water resistance was improved. XPS, static and dynamic contact angles and capillary wetting studies indicate a substantial gradient in surface energy normal to the treated paper surface. 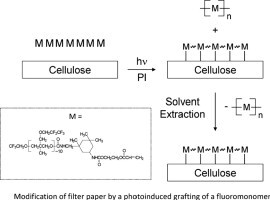 Modification of filter paper by a photoinduced grafting of a fluoromonomer. ► UV-induced grafting of cellulose is a successful strategy for paper modification ► A short ( C2F5) perfluoroalkyl chain acrylate was grafted on filter paper ► Its surface composition was changed as assessed by surface spectroscopies ► Quasi superhydrophobicity and oleophobicity was imparted to paper ► Grease resistance and water resistance of paper were improved. Fig. 1. Structure of fluorinated monomer, PolyFox PF-3510. Fig. 2. Fluorine weight percentages by potentiometric titration. Fluorine weight percentage (vs paper mass) as a function of irradiation time (0, 0.5, 2 min), photoinitiator (PI = benzophenone 0–1.5 wt%) and fluoromonomer PF-3510 concentration (1–4 g/L); irradiation under nitrogen, Iflux = 51 mW/cm2. Fig. 3. Hexadecane (□) and water (○) capillary wetting data for Sample 9. In this particular example, the wetting slope yields θ ≈ 44° for hexadecane and ∼37° for water. Fig. 4. 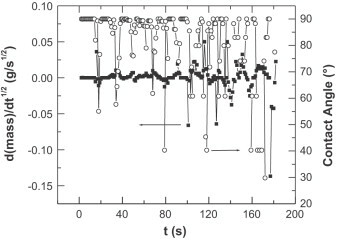 Capillary wetting slope (■) with time and resultant contact angles (○) using water as probe liquid for Sample 9 using data from Fig. 3 and Eq. (2). Fig. 5. Dynamic contact angles and volumes for treated paper samples. Data for Samples 5A (□), 2A (○), 9 (▵), 7A (▿) and 8 (♢) are shown. Fig. 6. ATR-FTIR spectra of treated samples. 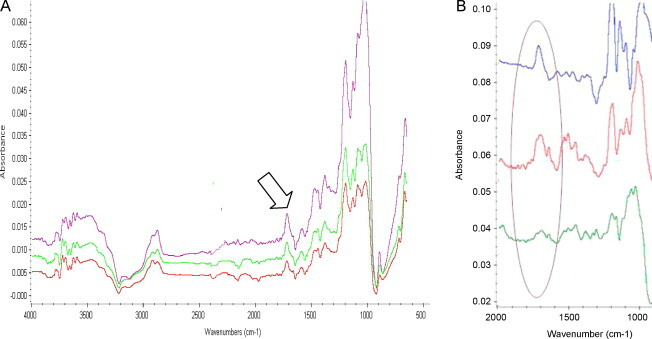 (A) Photoinitiator PI = 1.5 wt%, irradiation time = 1 min under nitrogen, fluoromonomer concentration = 4 g/L; spectra taken from three different points. Arrow indicates region of carbonyl stretch and unique to the fluorinated monomer/polymer. (B) Fluoromonomer concentration: 4 g/L (top spectrum), 2 g/L (middle spectrum), and 1 g/L (bottom spectrum) with ellipse showing carbonyl region of interest. Scheme 1. Photodissociation of the photoinitiator and hydrogen abstraction from the cellulose. Scheme 2. 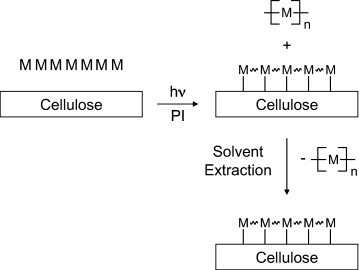 Photografting of monomer M onto cellulose and its photopolymerization. Table 1. 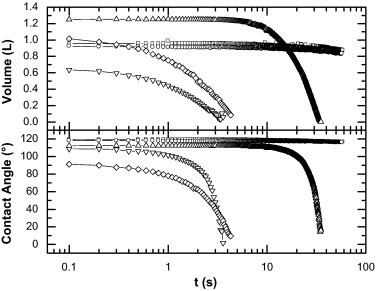 Contact angles of filter papers UV-grafted with fluoromonomer PolyFox PF-3510 (photoinitiator, PI = benzophenone, irradiation under nitrogen at Iflux = 51 mW/cm2 unless stated otherwise). Table 2. Capillary wetting and dynamic contact angle data for treated paper samples (photoinitiator, PI = benzophenone, irradiation under nitrogen at Iflux = 51 mW/cm2 unless stated otherwise). After application of Wenzel correction. Table 3. XPS results: F/C, O/C and F/O ratios at different take off angles (t.o.a.) as a function of the fluoromonomer PolyFox PF-3510 concentration and photoinitiator composition (PI = benzophenone). Irradiation time = 2 min and flux = 51 mW/cm2. Table 4. 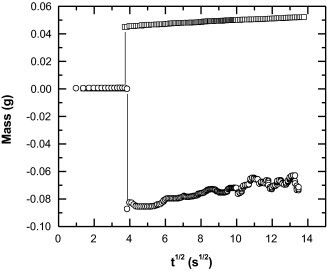 Monomer content at the paper surface (estimated on the basis of the XPS data at t.o.a. = 25°). irradtiation time = 2 min I = 51 mW/cm2.